While turtles may not be renowned for their land speed, they don't necessarily need to be able to outrun predators. Many turtles, including the commonly domesticated box turtle, are able to retract their heads and legs into their shells as a defensive maneuver. However, not all turtles have this skill -- it all depends on the species. Not all turtles can pull their heads and legs all the way into their shells, but that doesn't make their natural armor any less valuable. The turtle's shell is a natural part of his body made out of flat, hard plates. The plates are permanently connected to his body at multiple points, including the ribs and shoulders, so he can't take his shell off and find a new one -- he and his shell are joined for life, and it gives him valuable protection against predators. Different turtle species are able to retract their legs and heads to varying degrees. 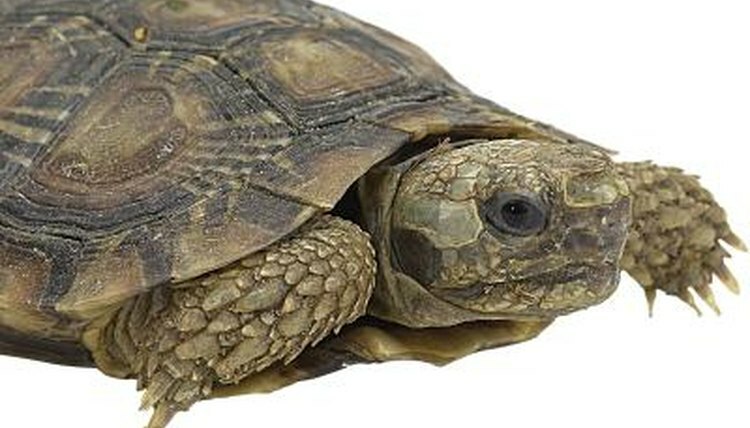 In general, land turtles like the box turtle retract their heads, legs and tails to protect themselves from predators. While there is a gap between the two halves of the shell, the legs and head retract enough that a typical predator can't access them -- the turtle will stay shut up like this until the threat is gone. Some species, like mud turtles, can actually retract their limbs and then clamp the shell closed. Not all turtles have the power to pull in their limbs to hide in their shells. This is a quality that land turtles and aquatic turtles generally don't share. For example, instead of having feet like a land turtle, sea turtles have flippers that allow them to swim more effectively. Their flippers are permanently outside the shell, though, so these types of turtles are unable to defend themselves by retreating inside. Hiding inside the shell isn't a turtle's only defensive maneuver -- the rest, however, depend on his species. For example, snapping turtles are so named because they have powerful jaws that can fend off predators. Mud turtles are able to deter predators by releasing a foul, odorous bodily fluid. Thanks to their shells and defenses like these, land turtles may be able to keep themselves safe, despite their general lack of agility or speed.